It’s the name of the game in college hockey; every four years, you have what amounts to a completely different team. The NAU Ice Jacks graduated 14 players between its American Collegiate Hockey Association Division II and Division III teams last year. But while the roster turnover is not small – and most of those seniors were on the Division II team that finished ninth at nationals last season – neither are the program’s tryout numbers. NAU saw 93 players skate for the 56 roster spots between the two teams. But that doesn’t mean the team expects to enter any sort of rebuilding phase. “We think we have some excellent young players that are going to develop,” Fairchild said. That includes Phoenix’s Daniel Diaz, as well as some from Southern Californians like Rick Lawrence and Jacob Pascale. With so many new players, some stability helps, and that comes in the form of captain and senior defenseman Cameron McDonald, a former player with the Scottsdale-based Phoenix Jr. Coyotes program. 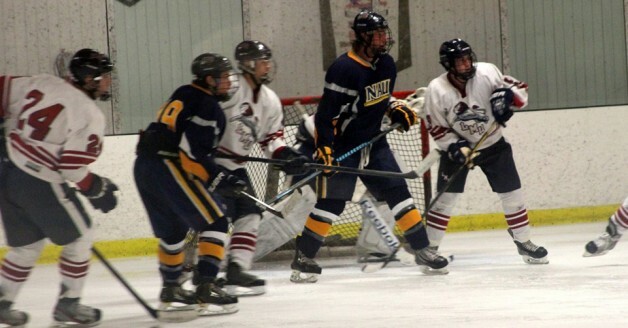 NAU’s D-II team started the season 4-1-0 – its only early loss coming to D-I University of Arizona – proving the program is retooled and ready to make another run at the ACHA title, be it with new faces or old.